Your sales system is probably outdated. We have seen, quite literally, thousands of sales systems, and most of them look like they came straight out of 2005. Nowadays, it's essential that you build a system that serves the modern buyer—they're pickier than ever. Consumer giants like Amazon and Airbnb have set the bar high for a smooth and simplified buying experience. The modern buyer has become even more informed, more independent, and more demanding than ever as these B2C expectations are crossing the line into B2B buying. And if you're still working out of spreadsheets and notebooks at your desk, there can be no more excuses. The time for a system overhaul is now. Your prospects no longer have the patience for manual data entry or for you to look through your personal files. When investing in your sales enablement technology, here is why you need to serve the modern buyer, and here is what they're looking for. Sometimes the course of drip campaigns, starting from the top of the funnel all the way down to the bottom, would last a couple months! That's far too slow for the modern buyer now. That's not to say workflows and drip campaigns are dead. They should still be a piece of your sales system puzzle to ensure you capture all types of buyers. But as you implement faster channels for your prospects to talk to sales, you'll see those out-win your workflows and drip campaigns more and more. A CTA to book a meeting with a sales person now. "Call now" button (No, seriously). Online chats to chat with a real person. Chatbots to book meetings and further qualify leads. Modern buyers don't want to dig up your information. Stop. Making. It. Hard. To. Learn. About. Your. Company. Make it easy for your buyers to do their homework. I guarantee they're already looking up information about you wherever they can find it. Modern buyers want to talk to you. Sort of. There will still be those cases where a prospect wants to pick up the phone and talk directly to you, the sales person. But with the growing popularity of chatbots, it's clear that AI and bots are reigning supreme in sales conversations today. It's not that everybody wants C-3PO as their BFF (Well. Not entirely true. ), but having an instant response on your online chat gets your prospect an immediate connection; an instant response. Your chatbot can give your website visitors that opportunity to easily communicate with your brand and even get answers to some common, complex questions. Chatbots also have the added benefit of being approachable—no risk of saying something stupid in front of someone to judge you. If you're as socially awkward as me, you may understand how much of a bonus this is. Immediate gratification is one of the key ingredients to your sales system strategy. No, we're not saying you need to answer calls at all hours of the day. For the sake of your sanity, I wouldn't recommend it. But your sales system isn't allowed to sleep. With an optimized process combined with the power of chatbots and workflow automation, a prospect should be able to browse your website, study up, get their questions answered, and book a meeting on your calendar, all without ever having to talk to you. If you can empower your leads to do all of that, then you've done your job. 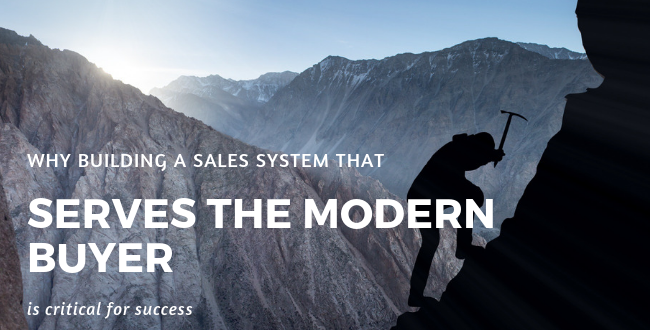 In summary, your sales system needs to accommodate a modern buyer that expects things to happen fast and now, and they'd love to do everything themselves if they can. Building your sales system comes down to one thing: reducing friction. Make it as easy as possible for your prospects and you'll win more clients. So long as you ask yourself, "How can I make this easier for my prospects?" you'll find yourself in more sales conversations with happier clients. Having worked at a HubSpot Partner agency right out of college, Stephanie has led and strategized more lead-generation and conversion campaigns than she's able to count. She's developed an arsenal of marketing tools and data analysis platforms that helps show ROI in the most compelling ways for her clients, and her digital marketing expertise grows and transforms with the constantly changing online landscape. When she's not working, you can find her petting some dogs, pumping iron at the gym,..